• Heyer and Markus Egger had the eighth most qualifying points in their quest to play in the 2004 Athens Olympics but ranked third among Swiss teams, making them the highest ranked team to not qualify for the Games. • Heyer secured a berth in the 2012 London Olympics in the last qualifying event, the Grand Slam in Rome, when he and Sebastian Chevallier tied their career best as a team with a bronze medal. 2009: Heyer and Heuscher had a best of fifth twice on the FIVB Tour. On the CEV Tour the pair played in three finals, winning once, and finished fifth in the European Championships. 2008: Heyer and Heuscher played in nine FIVB events with a best of ninth. The duo won two medals on the CEV Tour, and placed fifth in the European Championships. 2007: Heyer formed a new partnership with Patrick Heuscher, winning a bronze in their first event together. They later won a silver medal, and placed 17th in the World Championships in Gstaad. They won an FIVB Satellite and a CEV event before finishing ninth in the European Championships. 2006: Heyer and Laciga had a best of fifth in their 10 FIVB events together. 2005: Heyer formed a partnership with Paul Laciga, advancing to two semifinals including winning a silver medal in the World Championships in Berlin in what was just their fourth FIVB event together. They also played in two CEV events with a best of ninth, and Heyer finished ninth with David Wenger in a CEV event. 2004: Heyer and Markus Egger won two medals, a silver and a bronze, finishing the year as the seventh-ranked teams in season points. The duo played in two CEV tournaments, finishing third before a second-place finish in the European Championships. 2003: Heyer and Markus Egger played in 10 FIVB events, placing fifth four times and winning their second silver medal. They placed 17th in the World Championships in Rio de Janeiro and finished third in an FIVB Satellite. They finished third in an FIVB Satellite and played in two CEV tournaments, winning one before placing third in the European Championships. 2002: Heyer continued playing with Markus Egger, winning his first medal, a silver, in a Grand Slam in Klagenfurt. The duo played in nine FIVB events and one CEV tournament, finishing seventh in the European Championships. 2001: Heyer and Markus Egger played in nine FIVB events, advancing to the main draw in five of the six qualifiers they played in, including twice getting a best of ninth place. Three other times the duo was seeded directly into the main draw, including the World Championships in Klagenfurt where they finished 17th. The duo placed third in an FIVB Satellite and won the CEV European Championships. 2000: Heyer and Walser played in three FIVB qualifiers. The duo finished third in an FIVB Challenger and 13th in a CEV event. Heyer teamed with Markus Egger for two FIVB Satellite tournaments, finishing second in one and winning the other one. They duo also placed second in the CEV European Championships. 1999: Heyer formed a new partnership with Martin Tschudi, competing in eight FIVB qualifiers, including finishing 41st in the World Championships in Marseille. The duo had a best finish of 25th after being seeded directly into a main draw. The pair played in three FIVB Satellite events, with a best of third. They also placed seventh in the CEV European Championships. 1998: Heyer partnered with Martin Fluckiger, playing in three FIVB qualifiers. The duo also played in one FIVB Satellite event, finishing ninth. 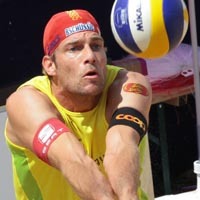 Heyer and Walser placed ninth in an FIVB Challenger. 1997: Heyer and Markus Egger played four times, with a best of 17th twice. He also played one tournament with Stefan Kobel, losing in the qualifier. 1996: Heyer played alongside Martin Walser in five FIVB tournaments with a best of 17th twice. THe duo also finished fourth in their only CEV event. 1995: Heyer competed in his first FIVB event, losing in the qualifier. Born in Zurich, Heyer and his family current reside in Frauenfeld. He and his wife (Nicole) have a son (Saro) and daughter (Nila). The son of (Balthasar Felix and Silvia Elisabeth), Heyer has two brothers (Jan and Sven). Heyer has a Master of Science degree from a school in Switzerland. Heyer started playing volleyball in 1989 and began competing on the beach in 1991. Heyer also served several seasons as a representative for the players on the FIVB Beach Volleyball Commission. • In the 2008 Beijing Olympics Heyer qualified with Patrick Heuscher as the 11th seed. The pair went 1-2 in pool play, but then lost in the lucky loser match, finishing 17th.